Let’s help make the hands that rock the cradle look good again. Women focus on their face, then slowly improve their necks and chest to match their face. However we must not forget about another important part of our body, the hands. We all love advances in cosmetic and aesthetic treatments. What can one do to help their hands. Hands start to look older when the skin loses its elasticity and the fat disappears, giving way to bulging veins and tendon’s. What’s important to consider is also appearance of dark spots or sun spots which give away the aging hands. Therefore the perfect combination treatment is to remove the age spots, tighten and thicken aging thinning skin and plump up the volume. Dr. Lin will educate you about all the different options during your consultation. We would start by adding topical 20% Vitamin C Serum to stimulate collagen production. Increasing oral supplementation of collagen and HA will also help to strengthen the skin. If there are dark spots, start using a prescription strength bleaching cream to lighten the spots. One can also have a chemical peel followed by at home enzyme peels to remove outer dull skin and stimulate younger skin regeneration. To improve the volume, one can inject growth factor peptides and hyaluronic acid fillers to quickly restore the volume. There are no downtime from the procedure and depending on the severity of volume loss will determine number of treatments needed. Newer threads composed of filler material are being used to tighten an volumize the hands . 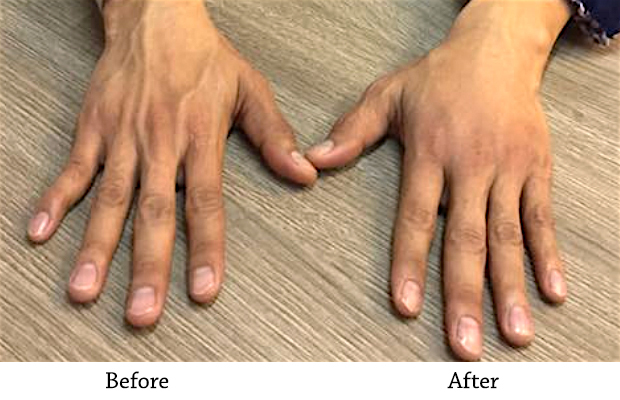 With the help of new anti-aging growth factors and injection techniques you can have young and rejuvenated hands that will not give your age away.